Five and six-sprocket wheels are subjected to heat treatment and precision grinding. KCI Konecranes is introducing some of Australia’s first XN electric chain hoists to the $99m Fosterville Gold project. The four XN hoists complement a 2t portal crane and a jib crane. They are designed for smooth lifting for maintenance and production work at the Fosterville project being built near Bendigo in country Victoria. The hoists are available in capacities from 60kg to 7500kg. They offer two-speed hoisting, variable traveling speed, built-in control panel and they meet IP55 standards. To achieve high load tolerances and smooth lifting, their five and six-sprocket wheels are subjected to heat treatment and precision grinding. The XN’s electromagnetic disc brakes are designed for high efficiency, total safety and easy access while helping to keep maintenance and production flowing. The XN’s friction type torque limiter prevents misuse of the hoist from overload and protects against accidental overhoisting and overlowering. For maximum safety, the limiter is integrated with the brake to ensure the load is always stopped when the control button is released, even if the limiter slips (on models XN1 to XN 10). The XN range has a lifting hook made of high-grade steel and with a safety catch. Motors are available with various voltages and, for operator safety, low voltage control is standard. An enclosed electric control panel contains all electrical components such as contactors, transformer and terminal strips. This also provides easy access for maintenance. The epoxy painted hoist body is constructed from pressure cast aluminium for low weight and efficient heat dissipation via its ribbed design. 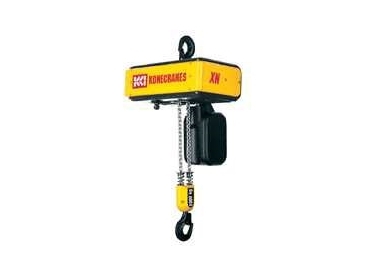 The hoists also have a high tensile strength heat-treated and zinc-coated load chain. The chain is calibrated for chain hoist use. Different versions are available for maximum efficiency in workshops, warehouses, process plants and factories. They include a push trolley, a motor trolley, the XM light crane trolley, the Handix hand-operated hook block with built in push button box, and a short headroom trolley for loads up to 5000kg.